As the water fury abates after the worst flooding in 100 years in Kerala, the relief and rehabilitation work gathers pace. But the displacement and pain lingers. It is clear that the road to recovery will be long and arduous. Indian Railways, which is the land's greatest connector, is also doing its bit, assiduously working 24 hours to provide relief to the beleaguered people of Kerala. Railway minister Piyush Goyal talking to Financial Chronicle outlined the efforts: "Using the complete heft of the Indian Railways, we have used all the resources available to alleviate the woes of this great human tragedy that has unfolded in Kerala, from special trains to transport relief material to medical and food special rakes to shelter arrangements at railway premises to using our catering establishments in Thiruvananthapuram and Palakkad to operate round-the-clock, we have expeditiously moved on all fronts. Our presence will be enhanced and enlarged going forward." While normal traffic has been restored since August 27, the railways itself has suffered enormous damage. 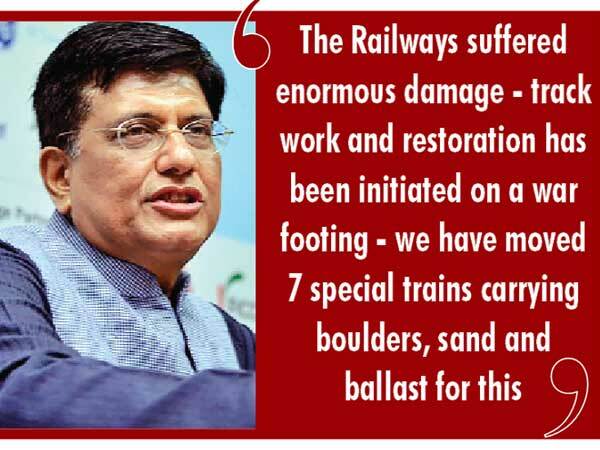 Goyal added: "The converse is that railways have suffered enormous damage - track work and restoration has been initiated on a war footing - we have moved 7 special trains carrying boulders, sand and ballast for this. 61 passenger special and 13 express specials were run across various divisions to connect stranded passengers." A total number of nine track machines were deployed round the clock to repair the tracks. By far the worst damage has taken place in the Thiruvananthapuram Division, water level rose above danger level across 11 bridges, track got submerged at three locations, embankment washed away at three locations, Earth slips occurred at seven locations over various sections, in Palakkad Division, water level rose above danger level across 10 bridges and track got submerged at one location and in Madurai Division, earth slip and falling of boulders occurred at six locations. *Southern Railway dispatched first water special with 7 BRN wagons carrying 2.8 lakh litres of water from Erode junction sation to Kayamulam on August 18. *Railways are running more water specials to meet the request of the state government. *Three lakh Rail Neer Bottles from IRCTC pants in Southern Railway. *One rake containing 2500 tons of rce dispatched from Raipur to Kazhakutam by the Chhattisgarh government to support flood victims of Kerala,. Railways didn't charge any freight for this consignment. The rake is on run to the destination and is being closely monitored. *3000 bedsheets and 300 blankets are already handed over to the relief authorities by Thiruvananthapuram Division. *4000 bed sheets and 700 blankets are also being arranged from six division’s to Sr DCM Trivandrum to be handed over to Relief Authorities. *One VPU loaded with flood relief materials containing rice, dal, sooji, atta, oils, sugar, clothes, medicines, bleaching powder, etc. sent by SWR from Yashvantpur to Palakkad Division by Train No.16515 for distribution in Kerala. *150 water purifiers sent by Train No.12626 has reached Piravam Road of Kerala for distribution.